Rarely has a declaration of intent of this nature produced such a virulent media and political outcry either. The searing vociferation is compounded by the fact that its authors express themselves at length on subjects they know nothing about, most notably the French political class. It has also given numerous opportunities for minor powdered Marquis to hold forth on the ‘human rightsism’ of the Commission, with no regard of the values, the rights and the traditions of the Republic which they claim to possess. The announcement of the deadline had worked as a shield for the Community’s executive over the last few weeks in order to weather the storm of the crisis in the Mediterranean whilst also providing protection against the gales blowing from the British election campaign. It was time to deliver and the text arguing the Commission’s proposals is now on the European Union’s table. Since then, the Commission has hastened, and it is an understatement, since a few texts have not been formally adopted, to demonstrate that it was working on it by calling a new press room, on may the 27th,, making things clear. The Communication (2015) 240, even after a second reading, is not convincing. Quickly, doubt creeps in especially because the precipitation of declarations maintains the confusion on the proposed measures, the numbers and roles of stakeholders. Could this apparent desire to combat the most glaring flaws in asylum and immigration policy not, after all, be a pretext or an avoidance strategy destined to leave it up to the Member States to take responsibility for policy failure in the eyes of the public? In other terms, does this noisy announcement not prefigure a funeral in due form at worst and, at best, a result far below the needs ? The European Agenda on Migration reveals the political engagement of Juncker, candidate in 2014. It also reveals the commitment of the President of the Commission to give political meaning to his actions as he had indeed previously announced. In a somewhat curious demarcation between the “immediate” and the long term, the discourse is far from seductive. Neither the appellation of this European Agenda on “Immigration” which surprisingly does not mention “asylum” nor its thematic structure provide for a convincing Commission Communication. Let’s begin with the immediate. The Mediterranean crisis is not given its true name- that is to say an asylum crisis well before an immigration crisis; this brutal pressure shows the limits of the Union’s border control policy. Inscribed in a shift of global migratory inflow, nothing would suggest that it would cease thanks to some additional budget and technical injections. Also, we struggle to understand the interest in separating and highlighting immediacy from long term goals except if it is to give credence to the idea that the causes may disappear abruptly which is entirely unlikely. The choice of presentation blurs the guidelines of the actions proposed by the Commission. Next and most especially it must be pointed out that asylum policy is in no case a component of immigration policy. This is indicated by treaties without a trace of doubt. This policy expresses an obligation which weighs not just on the Union but also on the Member States having individually subscribed to the international engagements under edict, from Geneva to Strasbourg. All of the British blustering makes no difference to the legal reality: it is not possible to “send back” persons seeking protection with or without the Union. Nor is this blustering all that credible in light of the self-proclaimed advantageous presentation as an island ‘fortress’ when in fact it is known that the United Kingdom on its own annually issues 700,000 of the 2.3 million residency permits granted in the Union. Grouping together these two distinct chapters “common asylum policy” on one side and “common immigration policy” on the other is a political error. By doing so it gives credence to the idea that accepting or denying a person seeking protection or an ordinary immigrant falls under the same procedure. However what constitutes an obligation for the first case is merely optional for the second one. This amalgamation by the Commission creates a disastrous political effect. It renders any effort at trying to educate with regards to national public opinion which already has a set view on the matter and refuses obstinately to listen to the necessity of protection or even to open the door to the continent to anybody whatsoever. The European Agenda claims to be providing a one-off response to an emergency situation whilst testing potential solutions for the future. One can understand the Commission wanting to assume its role in the management of a crisis which we already witnessed on 23rd April how the European Council then the European parliament took notice of the tragedy under way. Yet the reach of this discourse is clouded. How is the determination to chase after smugglers and save lives, to support frontline States’ efforts by allocating an extra almost 90 million euros for these chapters not an integral part of a solid, lasting migration policy in the Union? Such schemes must be intended as permanent and it is entirely doubtful that the current budget increase for certain agencies will be renewed due to the lack of true awareness and the rapidly worsening context. It indicates the order of political priorities within this common policy even if the listing of the envisaged means contains absolutely nothing new and if its poverty occasionally enhances a reading that merely highlights what already existed. Consequently, presenting sending a European migration liaison officer to high tension countries as some sort of progress likely to reverse the flow of migration brings a smile to our lips… Aligning millions of euros in an effort to prove the need of Mobility Partnerships for which we have yet to find out their real usefulness and Regional Development and Protection Programmes (RDPP) for North Africa and Horn of Africa are again far from convincing and just part of a political public relations spiel. The same holds true when the Commission gives in to its “action plan” addiction so as to propose measures aiming to make smuggling and trafficking a “high risk and low return”, criminal activity. These empty words have been heard time and time again within the Union circles. The idea itself is rather promising; fighting traffickers on the financial terrain as was the case for fighting certain forms of terrorism. However one remains perplexed as to how this could be implemented in an efficient way. On the contrary, modifying the legal basis of Frontex and thus reinforcing its capacity to initiate return missions would seem like a far more interesting proposition. Frontex is often pilloried because its task of monitoring and returning irregular migrants is far from gratifying. Yet this agency successfully carries out its missions and all that is its limiting further success is the parsimonious approach with which the Union’s States devote financial means to it. The second “pillar” of the Agenda simply refers to article 77 TFUE which mentions an “integrated management system for external borders”. It is politically linked to the objective of “saving lives”; it has been all too clear in light of recent current affairs how slow the members of the Union were to stand up and take notice. The Communication is not overly innovative on this point. All that is mentioned is the need to consolidate intervention standards on the ground alongside a promise to “launch a broad debate” over setting up a European system of Border Guards. None of this is likely to break the budget. As for the rest, using new technologies to identify risks or manage “smart borders”, or, notably, strengthening Frontex’s capacities and mandate, none of this is really anything new under the sun. What is probably more significant is the open backing of third countries via the Action Plan with Africa and in particular Regional Development and Protection Programmes which have been allocated an extra 30 million euros. The rumours surrounding this issue have been confirmed with two States being focussed on: Niger and Mali. With a view to improving safety for migrants and combatting against smugglers these proposals seem quite astonishing considering the situation of the latter State. Another now officially confirmed innovation is the backing of third States which will undoubtedly take the non-experimental form of a “pilot multi-purpose centre” and is to be set up in Niger thereby reigniting the debate dear to Tony Blair’s heart some ten years ago over externalisation of asylum policy. It should, according to the Commission, provide “provision of information, local protection and resettlement opportunities for those in need’” In other terms, circumventing migrants’ onward journeys by offering “assisted voluntary return options” for those who understand what that entails. With the support of the IOM and especially the UNCHR which has not opposed this scheme as a matter of principle, it would appear in all likelihood to become a key area of the Union’s policymaking. Yet another astonishing promise in light of the enormous investment in this common policy; two generations of successive texts have thus first laid the foundations then corrected the major flaws of the common asylum system. In affirming that high priority will be given to setting up an integral and coherent Common European Asylum System it is in fact the same as listing all of the breaches for which the Commission seems to be unaware that contentious proceeding exists in order to reach outcomes. Yet this prodedure would be of some use when the Communication states, for example, that progress could be made with “guidance, notably by encouraging States to systematically identify and take migrants’ fingerprints”, which is a clear reference to Italian practices. In the same vein, the Commission refrains from a particularly deep analysis of the asylum figures which Eurostat has just published. By taking a closer look at the figures what quickly becomes clear is that the Union and individual States are faced with the same problem; a high concentration of applicants is found in the same zones. In France, for example, Ile-de-France and the Lyonnaise region bear the brunt of the pressure. What can also be seen is that recognition rates are somewhat variable- Eurostat queries the Hungarian recognition rate of 9%. The fluctuation among the types of protection granted to applicants of the same nationality depending on Member States could also be deemed surprising. None of this is even mentioned. Among the reasons which inspired the Commission to write the Communication are these figures which reveal the internal divisions within the Union. Although European asylum law is presumed to be harmonised, deeply worrying questions remain and no geographical responses are received. 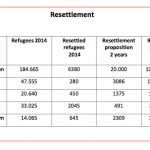 So, for the reasons that we are well aware of, the number of Syrians has quadrupled since 2012 and they now make up the largest contingent of asylum beneficiaries. Nevertheless, 60% of the 68,000 persons are placed under the protection of either Germany (27,500) or Sweden (16,800) and they are not the top nationality protected in France or in the United Kingdom. Similarly, though Eritrea (14,600 refugees) is the second most protected nationality in the Union, more than three quarters of the Eritreans obtain asylum in just three States: the United Kingdom, Sweden and the Netherlands. Is it any wonder to find them in Calais once they have been informed that 183 of their compatriots’ asylum requests were granted in France in 2014? Stating this in the midst of an irregular immigration crisis cannot be considered as overly deft politically, despite the terms of article 79 TFUE. The presentation of this “new” policy seems somewhat excessive; how can it be qualified as “new” when in fact it does not or barely exists as a Member State retains the right to define the total number able to access its respective job market? And yet, its main goal is obvious. It has been repeated for years by the Commission, confirmed by demographers and deliberately ignored by Member States which have firmly shut their eyes when faced with the demographic decline. In contrast, one cannot help but smile upon seeing the ‘Blue Card’ directive being brought back ou; aside from the 11,580 cards issued in Germany out of a total 12,854 in the entire Union in 2013, which other State issues any? 2. The outcome, a programmed burial ? The European Agenda on Migration displays two sides. That of a recycling operation of various measures, all of which had initially proven to be more or less complete failures. The other side is that of a new and strong political message querying the community of the Member States with no regard for the public opinion held in each state. It receives as such the strong and justified support of NGOs and UNHCR. This leads to some confusion in its reading. How can the clear discourse of the chief of the Community’s executive be criticised radically when he is finally speaking from a solid political standpoint (and it was high time to do so) in terms of solidarity? It has to be said that this solidarity is commendable as it is attempting at least to provoke real political change even if that enflames public opinion. The spectacle of irregular migrants and asylum seekers displays the blatant failure of joint policy. Any semblance of this was abandoned by the Commission after the only great commissioner that the JIA has ever known, Antonio Vitorino departed. Since then, verbiage, uncontrolled technocracy, standardised discourse and a surreal management culture have taken the place of any form of political direction. The latest Commission follows on in this tradition from what we can judge. Between 2012 and 2014, in two years, the number of asylum seekers in the Union doubled, jumping from slightly more than 300.000 requests to just over 600.000. This explosion poses major challenges for the Union and as we saw above, it reveals for all to see the weaknesses and lack of cohesion within it. And yet no political lesson is publicly drawn from this. So, the Dublin system, the cornerstone upon which the Common Asylum system is built, claims that since Schengen (its heir) the Member State in which migrants arrive in the Union is responsible for the processing of those migrants. This thereby establishes, on the face of it, the bulk of the pressure on the State Members situated on the periphery of the Union. But, if we are to look a little more closely at the asylum figures in order to gauge more than just who does the most and who does the least, much can be gleaned. Of the four Member States currently receiving 71% of asylum requests (Germany, Sweden, Italy and France), just one country, Italy, is in direct contact with the new arrivals. The failure of the Union’s strategy is thus based on figures without it causing much concern because, despite its flaws, the system continues to be accepted by the States, including those in the second line which refuse any change to it. Proof that the Commission refused to shoulder its responsibility was already evident in the polite silence heard over the dysfunctions of its cursory evaluation carried out during the revisions of the text in 2008, despite the criticisms of Parliament at the time. The problems remain and the figures are grim: the rate of asylum seekers transferred to the State responsible in accordance with the Dublin system barely reaches 16% annually in France, according to the last report from the French Senate. As for irregular immigration, Eurostat’s figures are also grim; the Commission is well aware of this fact when it quotes its figures: out of the 425,000 return decisions delivered in 2013, only 167 000 were correctly enforced. After having weathered the incomprehensible thunderbolts of those who had taken umbrage over the harmonisation of conditions in which returns must take place, the Union has not really tackled the problem which contaminates the entire issue, leaving judges to weave and unweave hesitant jurisprudence. Yet, putting names and faces to the focal point of grievances surrounding this blockage is now possible by, for example, listing the third States which are reticent in assuring the cost of taking back their own nationals who reside irregularly in Europe. In descending order Morocco, Pakistan, Albania, Russia, and India could thus represent grounds for diplomatic consideration. This is not impossible. So it can be noted in the Agenda that the Commission is at last envisaging modifying its practice of readmission agreements by now focusing on nationals and ceasing to believe that third States will indeed cover costs of foreign nationals having transited their territory seeing as this creates tension in interior affairs. One can wonder about this. Due to the sharpness of the President of the Commission’s political intelligence alongside there being not a shadow of doubt over his perfect knowledge of the European context the risks involved in certain leading proposals cannot be ignored. But a double-edged discourse confuses matters and inevitably leads either to failure of this attempt or to empty it of its scope. As we denounced above, the initial amalgam involves fostering a detestable ambiguity between asylum seekers and ordinary migrants both from a political and technical standpoint. Those applying for protection are reduced to the lowest common denominator, stigmatised and they therefore become the primary victims of this amalgamation. And now today it is precisely the first tangible result of the Commission’s communication. The press has unanimously and blithely mixed up the numbers in the proposals of the Commission which exclusively deal with asylum seekers. However the press mixed up these figures with those of ordinary irregular migrants. This misinterpretation induced by the biased presentation of the Agenda was of course immediately relayed by the political class in its entirety and, within a few member states such as France, the confusion is obvious as the various interpretations of the President and the Prime minister clearly show. A second trouble reigns over the impact created following the Commission’s announcement of the proposals of “relocation” and “resettlement”. Yet the idea is very simple: it refers to either people who are already in the Union (relocation) or those who are still outside of it (resettlement). The European Agenda in fact outlines two distinct measures which concern totally different situations and the vagueness of what is said combined with the mix-up surrounding by the word “quotas” is far too obvious to have escaped the authors’ attention. Clarifying and completing things was probably the aim pursued by the May 27th press room where the announced texts were not available and, for the Recommandation, not even formally adopted !!! The first proposal is entirely new. It involves instigating a temporary “resettlement” procedure in the case of applicants who “are in clear need of protection”. This proposal would be justified under the principle of solidarity of article 80 TFUE so as to “ensure the fair sharing of responsibility between all of the Member States”. The Commission thus proposes “triggering the emergency response system envisaged under Article 78(3) TFEU”. This is in fact a preconceived lie; the treaty does not to date contain an “emergency response system” but on a much more modest scale, an emergency “procedure”. Indeed, the procedure states that “in the event of one or more Member States being confronted by an emergency situation characterised by a sudden inflow of nationals of third countries, the Council, on a proposal from the Commission, may adopt provisional measures for the benefit of the Member State(s) concerned. It shall act after consulting the European Parliament.” No more, no less and by qualified majority. Hence a more careful formulation since then, that of a “Proposal for provisional emergency relocation measures”. The Commission shows no fear in anticipating the agreement of the Member States in Council; this is yet another highly revealing novelty. The “relocation” would appear to concern in all likelihood applicants who have already entered the Union’s soil, illegally as the Commission said it. 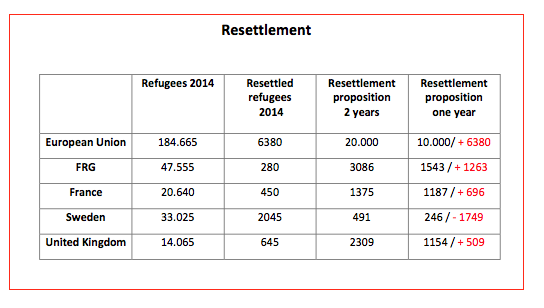 Logically enough but rather arbitrarily, the Commission adds that those eligible for relocation are therefore applicants with nationalities who have an average EU recognition rate for international protection that is equal to or above 75%, according to the latest available EU-wide Eurostat data, in other words, Syrians and Eritreans. Obviously the three Member States concerned by the opt-out provision with regards to certain policies of the Area of freedom could choose to not be involved in the deliberation of the scheme which is indeed the case for the United Kingdom as it has already announced. Technically, it is a a limited and temporary derogation fromcertain provisions of the Dublin Regulation, in particular as regards the criterion for determining theMember State responsible for examining an asylum application. Will it receive the consent of the States supporting the text who refused any substantial change ? In a second time, on May 27th 2015, the Commission judged it necessary to give detailed figures, which it had not two weeks earlier. First, concerning the volume of the concerned persons : there would be 40.000 of them. that is 40% of the total number of applicants who entered irregularly Italy and Greece in 2014. The distribution of the 40,000 total between the two countries, respectively 24,000 from Italy and 16,000 from Greece, is based on their respective shares of the total number of irregular border crossings of persons in clear need of international protection over the last year. In return, the States accepting relocation will receive a €6000 lump sum for each relocated person, under the Asylum, Migration and Integration Fund (AMIF), an extra €240 million in dedicated funding to support this 24 month scheme. And the Commission does not leave it at that. On May 13th, it has even stated that it will table a legislative proposal after 2015 to render such a system “permanent”, “automatic” and “mandatory” (COM (2015) 240 p. 5). All of this in total contempt of the political balance of power and the sovereignty of the Member States which the rule of law of the Union cannot constrain to this point. Is this just a matter of reinforcing the attractiveness of an initiative which already gave rise to such strong opposition among Member States? A certain amount of surprise arises from the political and technical backing of this sequence. It is particularly true with regards to the rigid stalemate of the Commission over an existing tool, specifically designed for emergency situations. In fact, directive 2001/55 of 20 July 2001, on minimum standards for giving temporary protection in the event of a mass influx of displaced persons and on measures promoting a balance of efforts between Member States in receiving such persons. This text was drawn up, passed and implemented whilst war was waged in Kosovo: it provides a yardstick for Member States’ tolerance levels alongside the upper limit of their understanding. The Directive grants temporary protection in the Union … on a voluntary basis of States, as indicated in article 26. The Agenda does not mention this even once. Anyway, we will go back to it later in detail in these columns. Persons who “clearly need international protection”, are transferred from outside of Europe, that is to say from a third State to a Member State which agrees to accept the aforementioned persons, on the United Nations High Commissioner for Refugees’ recommendation who acts as an intermediary. It is no longer a question of a beating stick and obligations but more of a carrot. A simple “recommendation” from the Commission will enable a new “resettlement programme” to be set up which will apparently be added to the existing one and on top of that will be matched with a financial incitement of fifty million euros over the next two years. The distribution key of these applicants would be the same as for “relocation”, it would remain voluntary, with possible participation of the associated states. The reception of the European Agenda and more specifically of the proposals for distribution of asylum seekers is worthy of the paradigm change which it outlines. There is absolutely nothing surprising about NGOs and the High Commissioner for Refugees approving this direction. Nor is there anything surprising about the fact that Hungary, Poland, the United Kingdom and France (in a more ambiguous fashion) are against it while the other countries are keeping a prudent silence. In fact, it is the sovereign capacity of each State to decide to admit migrants in need of protection which is at question. Common reading of grounds for granting protection, mutual acknowledgement of decisions and judicial review are all stages that have to be traversed sooner or later. Appearing to be under no illusions as to the likelihood of these proposals being accepted, the president of the Commission has chosen to advance onto the terrain of provocation. Despite the implicit consent of the German delegation- including in Parliament- it is not yet the right time to move towards the next stage. Never mind for the Mediterranean graveyard, appearances have been kept up.